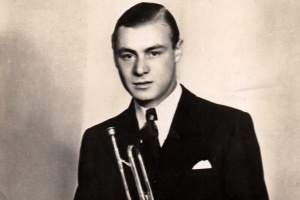 In March 2014 the National Jazz Archive acquired a collection of materials from Nat Gonella’s personal papers. The collection was donated to the Archive by his daughter, Natalie, and includes Nat's personal scrapbooks documenting his musical career, photos spanning decades including some of his time in the army during the Second World War, fan mail cards, PRS certificates, correspondence and the 'This Is Your Life' book from his 1960 appearance on the show, among a number of other items. This image shows a double page from one of Nat’s scrapbooks with his handwritten notes and cuttings from 1932. In the top left corner he has cut out a picture of Jack Hylton and handwritten a note saying ‘Jack Hylton who offered me a job’. 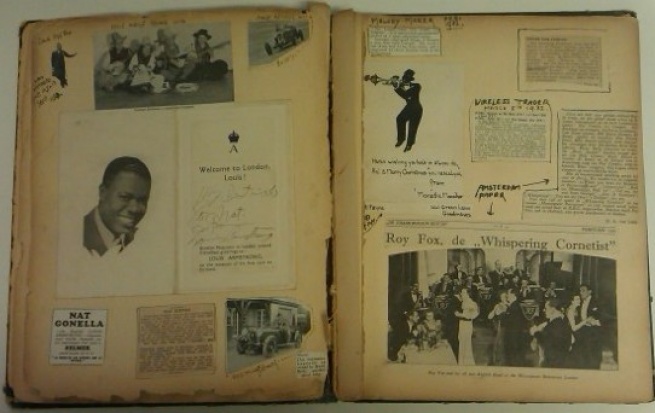 This page also includes a card saying ‘Welcome to London, Louis!’ proclaiming that ‘Brother Musicians in London extend friendliest greetings to Louis Armstrong on the occasion of his first visit to England’, which has also been signed to Nat from Louis. Leafing through this very personal collection of memories is a real treat. Explore the Archive for items the NJA has digitised, search the catalogue and come in and see the items for yourself.